These impressive Christmas cards look beautiful sparkling by the christmas tree lights. They do take a little while to make each but the result makes the time spent worth it, just make sure you reserve them for your favourite people only! Because this craft doesn’t use too many materials, and with just a little glueing and cutting required, it’s a great one to make with kids. 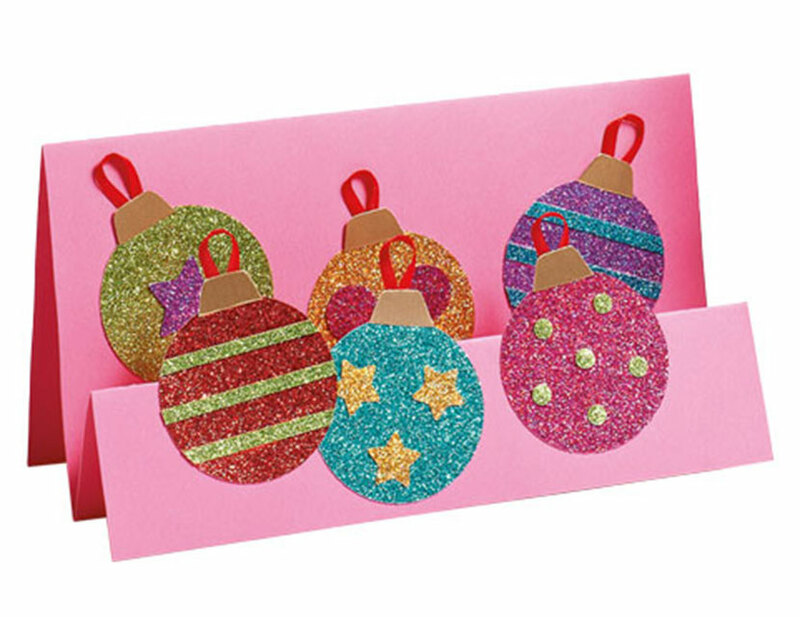 They’ll love the magical looking glittery paper and how neat and professional their finished cards look thanks to their pop-out element. You could try different shapes, depending on your preferred look. Christmas trees in the foreground and background would be lovely, as would robins, snowmen or presents. The only bounds are your imagination so let it run wild and see what you come up with! With the short side at the top, fold the sheet of pink card horizontally into thirds. Fold one of the end-thirds in half so the card stands up horizontally. Draw around a glass to cut six 2in circles from glitter paper. Decorate the circles with punched spots, stars and cut stripes. Add a gold topper and a red satin ribbon loop to each. Glue the baubles to the front of the folded sections of the card. Or simply use the bauble idea on a standard card.